ONHI keyboard for ipad pro 12.9 is specially design for 12.9 inch iPad Pro, will NOT FIT for iPad Air/iPad Mini or any other iPad or tablets! You can find the model number on the back of your iPad, please CHECK your iPad model before purchasing !The keyboard for ipad pro 12.9 case keyboard provide all-around protection your iPad, and the keyboard designed with the same number of keys as MacBook, that allows you type faster and more accurately. 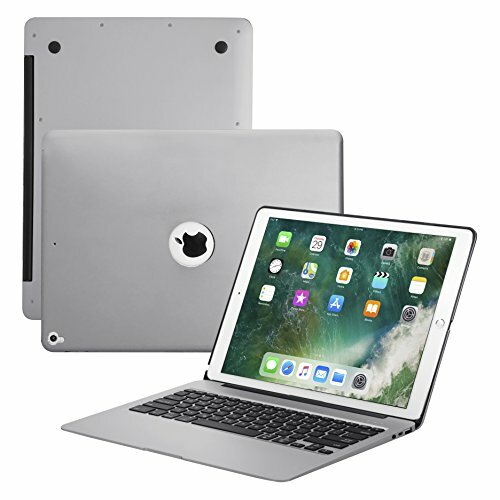 -The keyboard for ipad pro 12.9 case keyboard is made of high quality aluminum alloy to keep your iPad free from scratches, dust, wear and tear. Compatible with keyboard for ipad pro 12.9 only! -The keyboard case for ipad with 7-color led backlight to make your typing more convenient. -The keyboard for ipad pro 12.9 built-in 500mAh rechargeable battery. A charge allows the keyboard to stand for about 60 days. -The smart keyboard for ipad 12.9 perfect Access to all Switches, Sockets or Camera. 1.Please fully charge the keyboard and open it, the light comes on and then goes off. 3.Go to your iPad settings, click on connection and look for the keyboard. 4.Click on the keyboard and it will be connected. ULTRA SLIM STYLISH EXTERIOR IPAD ALUMINUM CASE - ONHI keyboard for ipad pro accessories keyboard case cover for i pad 12.9 will change your iPad Pro into a stylish laptop. Can be ipad 12.9 keypad can also be the ipad pro 12.9 case. Special Design for iPad Pro 12.9 inch (A1584/A1652/A1670/A1671), you can find the model number on the back of your iPad. Please CHECK with your tablet's model clearly before ordering! 0°-135° MULTIPLE-ANGLE ADJUSTABLE - Smart keyboard for ipad 12.9 shaft bracket design allow the keyboard for iPad to be tilted up to 135°to provide the most comfortable viewing position. The keyboard for ipad 12.9 can NOT be detached from the case. It fits perfectly with the device and all ports/buttons and camera can be accessed. 5600mAh POWER BANK/TRANSLUCENT SLILCONE KEYBOARD COVER - This keyboard offers powerful capacity power bank, with 5600mAh capacity power bank, can charge for your ipad pro, mobile phone, tablets and other device also provides a translucent silicone keyboard cover in place to protect your keyboard from dust. WARRANTY AND SUPPORT - ONHI keyboard case for ipad 12.9 provides you with 24-hour email contact service & 1-year worry-free warranty & 30-day money-back guarantee.Except the keyboard case,you will get a ipad keyboard protector. If you have any questions about this product by ONHI, contact us by completing and submitting the form below. If you are looking for a specif part number, please include it with your message.